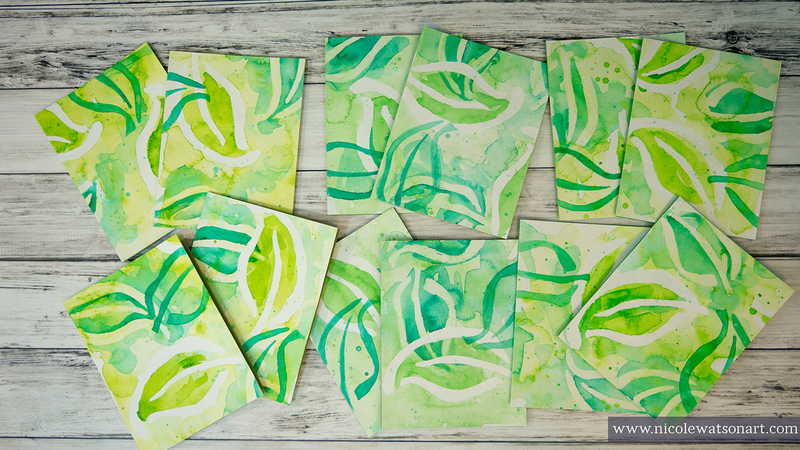 This week I'm using Donna's triple leaf stencil to create a background with watercolor using masking fluid. Sometimes I find it hard to juggle the not so fun stuff of life (laundry, dishes...) while fitting in moments of creativity. This project was a perfect way to accomplish both! Even though the process of creating the layered background itself is pretty simple, it does require drying time between the layers of watercolor and masking fluid. While the layers dried, I folded laundry and tackled the dishes....without neglecting my need to create (or forgetting my clothes in the wash!). You could easily keep this page in your art journal; just be sure to spray it with fixative so the watercolor doesn't run. However, I cut my backgrounds into card fronts. 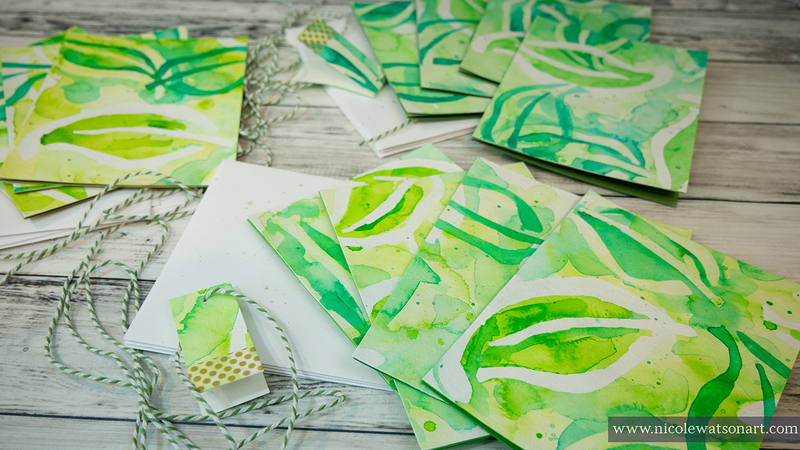 The bright green leaves shout summer to me and make beautiful plain note cards. In fact, I want to share these with YOU! Hop over to this video on YouTube or Instagram to see how you can win a set of the cards! Also, visit Instagram and grab a screen shot of the backgrounds to use as your phone wallpaper! It is available as an instastory and also in the Artist Gang highlights. Any type of watercolors will work with this project, and you definitely do not need to be an expert. This is all about flooding the page with color, creating puddles of color, and adding splatters for texture. 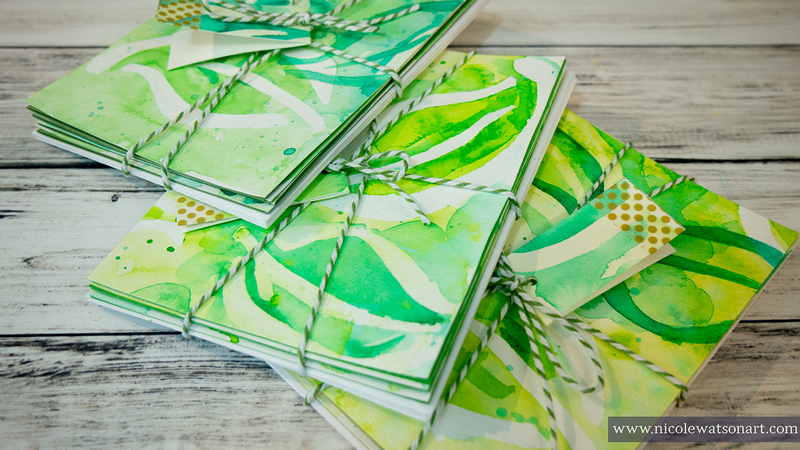 So, grab some masking fluid, one of donna's stencils, and create some layered backgrounds! There are minimal supplies needed to make these backgrounds, and they are all featured in the video above. You can find most of them in Donna's shop! While you’re here on Donna’s website, grab the triple leaf stencil so you can create a layered leaf background or three. Once you're finished, splatter the envelopes, bundle some cards up with bakers twine, add a tag from the cutting scraps, and share your masterpieces with a friend. After you've tried this technique, post what you've created in the donna downey : Community of Artists facebook page! Or, share on Instagram, and tag Donna Downey Studios.